LUMMI INDIAN RESERVATION, BELLINGHAM, Wash.—A fleet of boats piloted by Native and non-Native fishers gathered today in the waters off Xwe’chi’eXen (Cherry Point, Wash.) to stand with the Lummi Nation in opposition to the proposed Gateway Pacific coal terminal at Xwe’chi’eXen. A ceremony of thankfulness, remembrance and unity was held on the beach during the event. Lummi Indians maintain the largest Native fishing fleet in the United States, and Lummi fishers have worked in the Cherry Point fishery for thousands of years. If constructed, the terminal would be the largest coal terminal on the West Coast of North America. It would significantly degrade an already fragile and vulnerable crab, herring and salmon fishery, dealing a devastating blow to the economy of the fisher community. Another gathering of Lummi Indians and non-Indian residents from the local and regional community was held at Xwe’chi’eXen on Sept. 21 to call for the protection and preservation of Xwe’chi’eXen, which is the location of a 3,500 year old village site, and a landscape that is eligible for registry on the National Register of Historic Places. 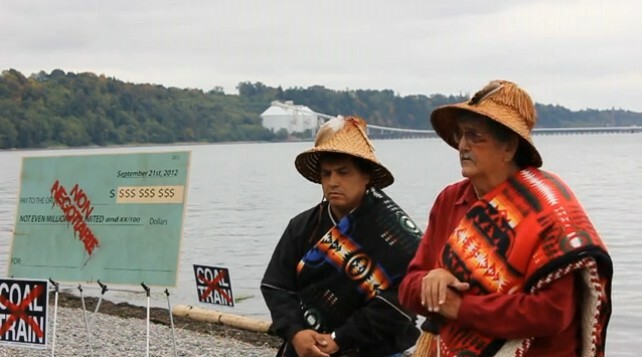 The Lummi Nation is participating in a broad intertribal coalition to defeat the project and to ensure that the natural and cultural legacy of Xwe’chi’eXen is protected in perpetuity.